Summary: The performances are universally natural and endearing. What could have been a trite, mawkish tale in lesser hands – you know, watch how a mean old prune’s heart is melted by a charming young tyke! – is moulded into a typically moving human drama by the great Yasujiro Ozu. The film remains resolutely low-key and steers clear of melodrama, Ozu (as always) instead delving into the small dramas of ordinary lives. Ozu manages to extract much from the subtlest of facial tic or throwaway exchange and the results are warm, witty and moving – without becoming manipulative. What initially seem like cold-hearted, cynical characters who reject a grubby kid are gradually revealed as warm, caring people who just need a little bit of prompting to bring the best out in them. The film does close with a ‘moral’ of sorts, the characters lecturing each other on what they’ve learnt through the preceding events; but even then it’s not over-the-top and doesn’t feel forced upon the story. Ozu’s movies languidly explore the pain but more importantly the joy of everyday life, and he manages to make it seem a fresh and funny experience that could compete with any fantastical extra-planetary adventure. 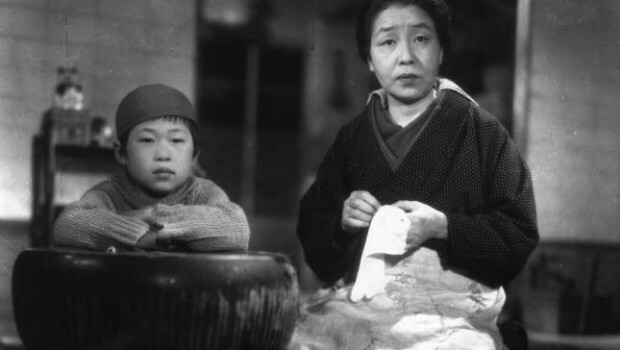 The story is casual and slow-moving, giving Ozu a chance to examine the minutiae of tenement life that encircle that characters – from blankets blowing in the breeze to (in one of the most winning scenes) tenants gathering for an impromptu singsong – and its these details that really make the film come alive. The performances are universally natural and endearing (apparently the result of Ozu’s fervid insistence on multiple takes), but special mention must surely go to Hohi Aoki who delivers a masterclass in charming-but-honest child thesping that should be made compulsory viewing for every kid actor working in Hollywood. The superlatives run dry here. Go buy it. Stills from the film, a brief short comparing the movie’s visuals before and after being digitally remastered and a commentary by softly spoken film critic Derek Malcolm. Malcolm’s commentary talks mainly about Ozu in general terms rather than Record of a Tenement Gentleman in particular and there are desert-like pauses in between his comments – possibly while he quaffs a sherry or devours a cucumber sandwich – but he does manage to throw up a few salient points. Part of the Ozu box set volume 2 along with Flavour of Green Tea Over Rice.